Peanut Butter, what’s the obsession with peanut butter? It’s as if when a person begins endurance sports they are taught a few things by some seemingly knowledgeable tri god. The first thing they are taught is that peanut butter is the best pre race and pre training meal available. Not that I don’t believe peanut butter is a great source of protein, nutrients, and EFAs….it is, and is a great choice during the day between workouts….just not on race morning! The second one on my rant list today is oatmeal; for some reason people like a good dose of fiber before they start their races and attempt to handle 3500+ calories of race nutrition. Interesting! Peanut butter: You see folks run into trouble when using peanut butter during pre workout or pre race periods. The purpose of any pre activity meal is to provide blood glucose for the impending activity. This is best done with a carbohydrate that is easily digested. Peanut butter does a great job of slowing digestion in the gut, which is one of the reasons it is so good during the day between workouts….it slows digestion of other foods and therefore dilutes the blood sugar response of anything else you may be eating. This is not a quality you want in a pre race meal where the intent is to get your system cleared to handle your race nutrition. You don’t want something that’s going to linger around in your gut and get in the way! Oatmeal: Oatmeal is a great food to have on a day to day basis since it has good nutrient density (for a grain), great fiber content, and an overall relatively low glycemic index. However, when it comes to race morning, the last thing you want is a fiber filled treat before you attempt to exercise for 10+ hours and handle your race nutrition! Oatmeal (and fiber in general) is known by its qualities to scrape the digestive system like Brillo pad and remove bile from the gut. Is “Brillo pad” a term you want in your vocabulary for a race day food item in IM? It’s easy to see how folks get confused with this since both of these items are “good for you” on a day to day basis. 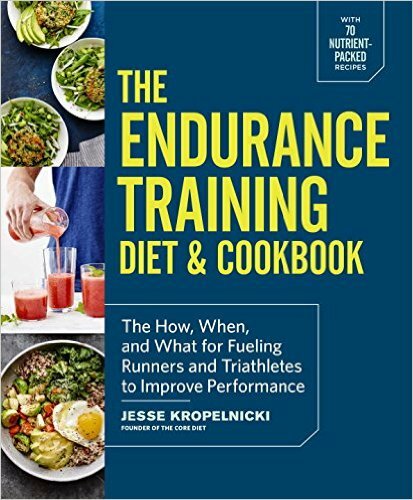 What is missed, is that race morning should be only those foods that will help you go faster on that day (and not upset your gut)….not necessarily the most nutrient dense foods. Its okay to eat bland, easily digested foods on race morning because they serve a specific purpose, to fuel the race that day. The only thing better than using peanut butter or oatmeal for your pre race breakfast, is using them together! I can’t tell you how many people I see make this ridiculous mistake, and its typically an “I’ve been doing this for years” type scenario. I do a lot of race fueling plans….for folks from the back of the back, to top 10 Kona pros. One thing I can tell you is that this little combination on race morning causes a lot of trouble for many, many folks. This frustrates me because athletes put so much work into their training and then miss a small detail like this, and end up with stomach issues in IM. The other thing that bothers me is just how many people make this mistake. I don’t know where some of this information comes from! The only issues I see as dominate as this one in the clients I work with, are the folks who drink water (as apposed to sport drink all day), or use products with only maltodextrin as a carbohydrate source……we’ll save those nuggets for another day and another porta-poddy stop!